Evolis has unveiled the AVANSIA, a new printer that utilizes retransfer-printing technology to deliver high quality, high durability cards. With retransfer printing, the card layout is first printed on a transparent film and then the print layer is transferred to the card. This technology makes it possible to cover the entire surface of the card, eliminate white edges and protect the print head from damage. AVANSIA’s 600-DPI print head delivers quality images, as well as sharp texts, microprints and watermarks. The retransfer technology supports and can improve a variety of applications: employee badges, secured access cards, student IDs, payment cards, official identification cards, driver licenses, and more. AVANSIA can issue more than 140 single-sided color cards per hour. The printer supports the delivery of cards in large runs, thanks to its large-capacity feeder and output hopper – 250 cards each – as well as consumables from the Evolis High Trust range that are engineered for this type of personalization. Retransfer technology makes it possible to print on any card profile – PVC, PET, polycarbonate, ABA, etc. – even on cards with an uneven surface. 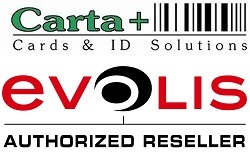 To support specific requirements, AVANSIA supports all types of encoding including magnetic stripe, contact smart cards and contactless smart cards. The AVANSIA offers an added layer of security via an RFID-based electronic key, which can be removed in order to prevent rogue use of the printer. A mechanical lock system is also available as an option. The AVANSIA comes with a three-year standard warranty, coupled with the lifetime warranty on the print head. For more information on Evolis’ latest printer solution, please ask our printer expert Marc Beukenhorst or fill in our Contact form.